The Road Trip. Part of the Great American Military-Family Experience, right? We do it to PCS across the country. We do it to visit family and friends who we moved away from so many years ago, a visit home. We do it to for some R&R, to get out and see parts of the country so many American families will never see. 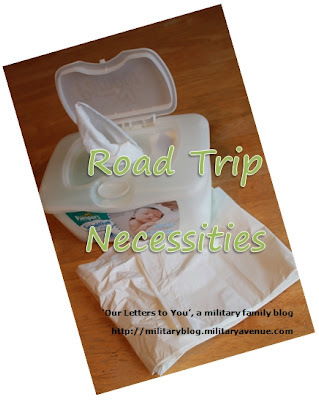 The Road Trip, it is part of the 'American Military Family' definition. So how do you prepare for such a great part of your experience as a military-family? I recently ran across some great posts that I thought I would share with you. Whether you will be travelling next week or not for a few months put these ideas away. After all an organized-trip is a smooth-trip! Or use a note book to do your own list. I loved this idea: "When planning a trip make your packing list & keep it, then make notes of what you didn't use, what you wish you would have brought etc." What a fun yet very practical journaling approach. It would be fun to watch your packing lists over the years evolve from diapers & formula, to coloring books & video games, then down the road to simple lists that involve just hubs and you gallivanting across the country as empty nesters. It happens faster then you know. Another important part of the Road Trip is entertainment. After all the minivan's DVD player only keeps them entertained for so long. I made this kit for my boys on our last across multiple-state lines Road Trip. It was a big hit and they still have their binders with all the knick-knacks they picked up along the way. Click through to learn what I included for my then 6 and 8 year old. Jill over at The Shafer Family wrote a great list for keeping her car organized in the day to day but this can be very useful when you plan on spending hours upon hours in the car. One example, keep a clean set of clothes bagged and accessible for each of the kids (/not/ buried under all the luggage). This is a necessity! First, even if you don't have babies in diapers buy a pack of baby wipes before you hit the road. Put that on your 'to buy' list right now, a car-trip necessity! Wipes clean up hands and faces, sticky seats and windows and even dabs of fast-food ketchup or mustard dropped on the driver's lap, amazing what experience teaches us. My second absolute necessity is a new big garbage bag (or three or four) that you can tie closed. One particularly long and winding country road last winter made me glad we were prepared. My 5 year old was in the back of the van and he suddenly said "Mom, I don't feel so good." I turned around quick enough to see him projectile vomit in three directions. Vomit everywhere, with at least four hours of car-ride in front of us. We pulled safely over where he changed into that spare set of clothes I mentioned above. We used the baby wipes to clean up his face, his hands, the seat, the windows, anything within a 10 feet radius of his seat. Then we stripped the high-back booster seat cover off and threw all the dirty clothes, the seat cover and anything else drenched in vomit in the garbage-bag and sealed it as tight as possible. That incident could have completely ruined the rest of our trip but that lone garbage bag made the hours remaining in the car tolerable. What tips do you have to offer? What do you absolutely /have to have/ on a road trip? How do you help your family stay organized for an outing involving hours upon hours in the car? We have some more great ideas from lots of resources at On the Road Again as well. This is great! Thank you so much. We're leaving tomorrow and I am adding garbage bags right now! This is a great post! I think you've thought of everything!